Meet Lauren Kenny from Christchurch, New Zealand. 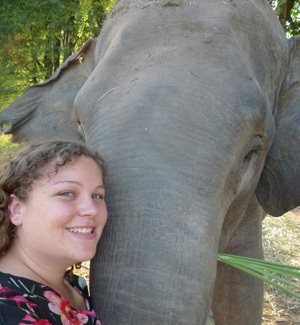 Lauren works as a Customer Service Representative and volunteered in the 2 Weeks Special program in Surin, Thailand with Volunteering Solutions. In her interview Lauren talks about the support she received from the coordinators, her daily routine and activities and why her experience in Thailand was unique and special. 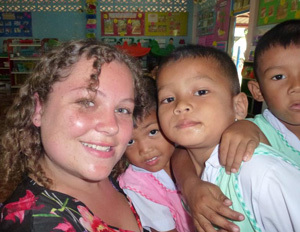 Why did you decide to volunteer with Volunteering Solutions in Thailand ? How was the Pre departure support and preparation before the trip ? I had done a lot of research online to find a group to volunteer with (which I had been thinking about for a while) and I was impressed by Volunteering Solutions website. The information on the website was clear and concise and the opportunities offered to a volunteer are much better than almost any other group, for less money! The Pre-departure support and information was very helpful as it gave me insight into the country I was going into and basic language and cultural expectations. It saved me from embarrassment by making a cultural faux-pas. Describe your daily activities as a volunteer. Volunteer Childcare Program in ThailandMy primary volunteering project was in childcare. This meant I was privileged enough to work with children from 3-6 years old. First thing in the morning we would sit in a circle and sing basic songs which such as "If you're happy and you know it clap your hands" and other playful songs which taught the kids their numbers. After this it would be "writing" time, when the kids would go over their letters or numbers in English through tracing. Then it would be play time, where the children would build things with over-sized building blocks. I routinely helped children build large towers, bridges, trucks or even guns. It was very interesting seeing how their brains worked! We would then serve the children with their lunch, which the school provided, and then set them down for a nap. At this point I went to have lunch with the teaching volunteers and then in the afternoon I would go to their classroom with them where we would teach English classes to children anywhere from 7-13 (it was a different class each day so it varied quite a bit). I did get the opportunity to spend two days at the elephant village as part of my program. This was really wonderful and immensely fulfilling. On the first day we spent the morning cutting down sugar cane for the elephants, then met Pilin, the elephant that lives with Mr Lee (at whose house we were staying). In the afternoon we rode elephants down to the river and we went for a bath with the elephants in the river. On our way back to Mr Lee's house we stopped at a temple and helped an elderly man bag up his rice, as it was rice harvesting time. The second day we went to an elephant show in the morning, which was amusing and entertaining. In the afternoon we went kayaking down the river and also jumped in the water for a swim. This was very refreshing and fun. What made this volunteer experience unique and special? How has this experience helped you grow personally and professionally and has it in any way impacted your future ? This experience has shown me in a practical way just how lucky I am, and how lucky New Zealand is. I live in a beautiful country that provides me and my family with so many opportunities that people in Thailand just don't get. It makes me want to help out more, so long as I am blessed enough to have the funds and an understanding employer.